Tommy Robinson read out Martin Sellner’s speech as promised at Speakers’ Corner on Sunday. I have gathered together what I thought was some of the most interesting footage I could find from the event. It wasn’t really a battle of course, it was a peaceful event for the most part although there was much pushing and some assaults did occur. Just for those unfamiliar with British law, you cannot claim self defence unless you are acting to prevent a crime being committed, which in this instance was clearly not the case, whatever had happened previously. Whether it was an act of retaliation or unprovoked aggression you can see for yourselves from the footage. Fight Breaks out at Tommy Robinson Hyde Park Speech! There was a significant police presence, and they formed a line between a group of Muslims and the rest of the crowd. 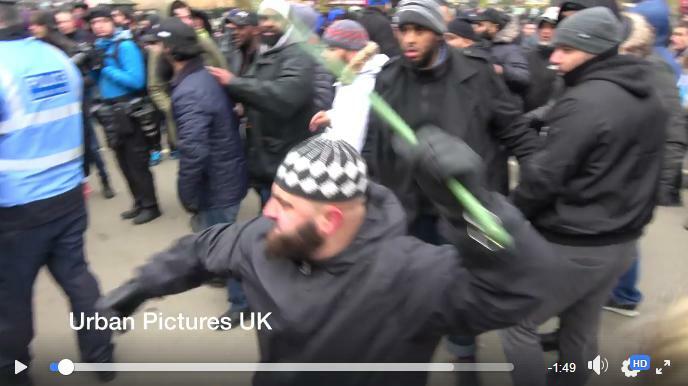 They focused on the larger non-Muslim part of the crowd and had their backs to the Muslims when the Muslim with the green stick attacked. There was a police camera filming the whole event mounted on the top of a police van. This created the feeling that we were being watched in a police state. Of course if non-Muslims were being treated equally under the law by the UK authorities today we would not have been troubled by its presence. However we know all too well how anxious they are to try to find evidence of “far-right extremism” and how anxious they are to ignore Muslim aggression. 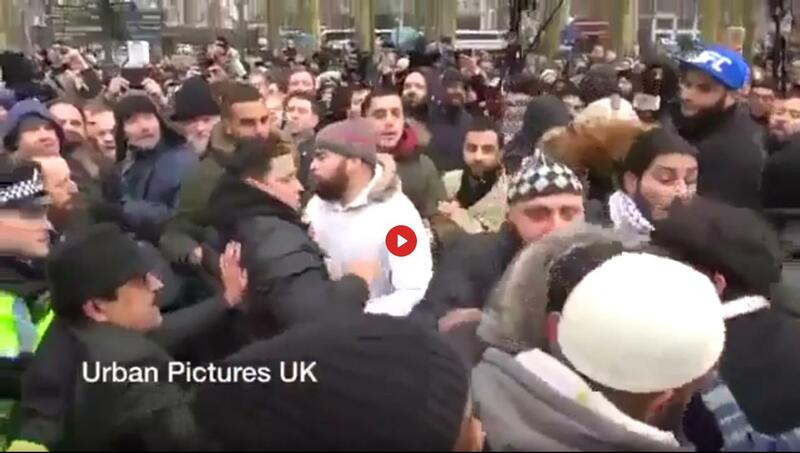 With so much video footage of the event it is hard to imagine how the authorities will manage to get away with not convicting the Muslim aggressors, but doubtless they will try, and they will get away with it if we fail to hold them to account. We have often heard the excuse “it’s not in the public interest to prosecute” but we insist that it is in the public interest, because we the public are very interested in seeing prosecutions for the above 2 assaults. 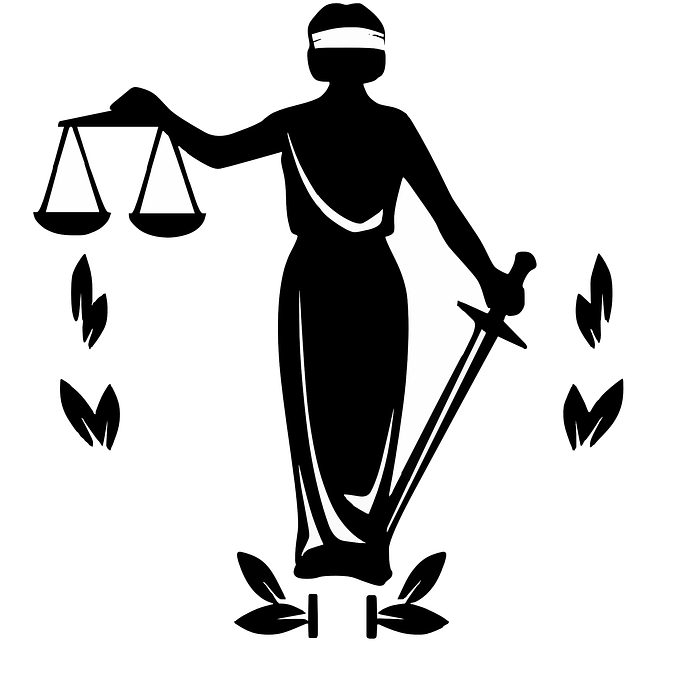 We are the people who pay the wages of those who are supposed to protect us, and we demand that justice is applied equally for all. The Mayor of London may be a man who is trying to divide us further with his “hate speech” rhetoric, but he is not the government and he does not have the power to alter the laws of the land. We need to ensure that the laws that limit speech are rationalized as soon as possible, and then ensure that the law is followed in all parts of the country equally. 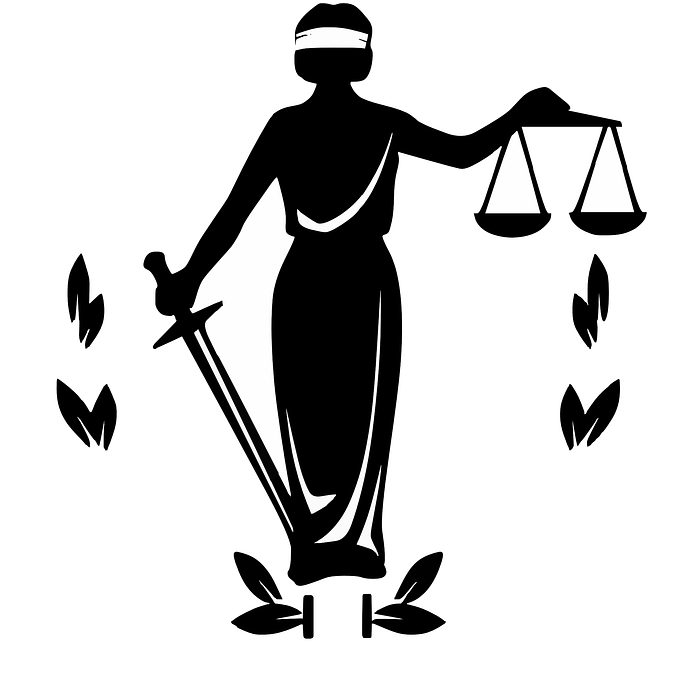 Those in authority who try to distort and abuse the law in their own narrow interests must be sacked and held to account in a court of law themselves if necessary. As I walked home through London and then boarded my train, I overheard many snippets of conversations. People were talking about vases, cakes, snowmen, holidays – you name it they were talking about everything except the pro free speech protest at Speakers’ Corner that I had just attended. The few thousand people who were there were a tiny section of the population of the UK, probably less than 0.01 % of the population. I had a feeling the country as a whole was asleep. The boiling frog analogy seemed entirely apt, and I must confess I felt a little depressed. However then I began to remember that the number of people who are active in politics is never a very large percentage of the population. The people who are orchestrating this pathetic display of appeasement – namely Theresa May and Amber Rudd in particular, are not even particularly representative of their own party. You may recall that Theresa May won the Tory leadership contest only by default because the media waged such a relentless campaign against her main opponent while scarcely criticizing May at all. The membership would more than likely have voted for her more traditional and genuinely conservative rival. It is the established mainstream media most of all that we need to circumvent in order to win the day and restore decency and common sense in our country. We can do this by becoming a viable alternative to the mainstream media ourselves at sites like this one, and by creating our own video footage and uploading it to sharing sites as the vloggers linked to above have done. I used to visit Speakers’ Corner years ago and it was a lot of fun then and there was never any aggression or violence at all. Mostly it was English eccentrics either of a socialist/communist or Christian persuasion, and sometimes speakers were just spouting random nonsense. It was a charming feature of life in London. Now as you can see from the above footage it is often dominated by Muslims and the atmosphere is often intimidating. Speakers face threatening behaviour and sometimes pushing as well – I have seen other such footage including the above from other occasions. I am saddened by what has become of this place, and much more so by the much more significant impact of Muslim immigration into the United Kingdom in general. I am saddened further by the appeasing attitude of the authorities which is causing growing resentment among the non-Muslims of the UK. As you can see from the above interviews, this resentment is not at all limited to people of a white Anglo-Saxon heritage, many people of other races and mixed race are also speaking out against the appeasement. It is time for a major shake-up of the political landscape in the UK, high time. This event was a battle in the sense that it was a battle to restore the freedom of speech and equality before the law that we used to take for granted.